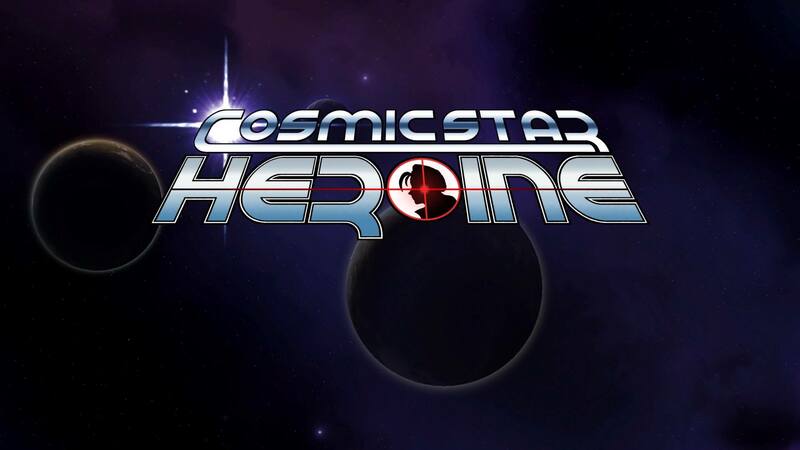 One statement to get out of the way right up front is that I was a Kickstarter backer for Cosmic Star Heroine, and for good reason. I am frankly extremely selective on which projects I’m willing to back so early in their inception on that platform. There have only been 2 previous games which have already released which I was a backer for, Mighty Number 9 and Torment: Tides of Numinera. And, while I did not regret backing either of them, I certainly felt a lot more positive about the latter of those two releases than I did the former, solidifying for me the risky prospect of investing money in an unknown quantity. Regardless, I have never invested more than just the price of the game itself (likewise in this case), so I’ve treated it as basically a pre-order platform in which I let the developers know up front that I will be buying their product. That both minimizes my potential risk, and it also makes it pretty moot ethics on reviewing a product that I’ve invested money in (although I largely think this is a moot point unless your backing method is as an investor and you are making money from how well it performs). So the more pertinent question is, what about this game made it stand out to me from very early on, enough to join the only 5 titles that I’ve ever backed, and whether that early vision was fully realized upon release? The graphics and cut scenes place this game style around the end of the 16 bit console era. There are really 2 major reasons that I backed this game, likewise with any other previous and subsequent. The first point of interest has to be whether the game itself is something that really resonates with me. If it’s not something that I’m really passionate about, then why not wait until it’s out and the reviewers have had a chance to play it before I commit? This game most definitely set fire to my passion though, it’s set firmly in the style of the late 16 bit era of JRPG on the SNES, Genesis, and the SEGA CD. Even from the early overview on Kickstarter you could tell that they were going for a mix of Chrono Trigger, Final Fantasy VI, Phantasy Star IV, and Lunar: The Silver Star. Your opinion on when JRPG’s peaked will vary (largely based on your age), but for me that was the peak time of JRPGs, so I was very interested in what their take would be. But that is the second reason I backed the game, or any game really, I trusted that Zeboyd Games would be able to pull it off. Between Breath of Death VII, Cthulu Saves the World, and their Penny Arcade games, I’ve known for a while that Zeboyd Games has been steadily getting better as a quality developer of retro styled games. 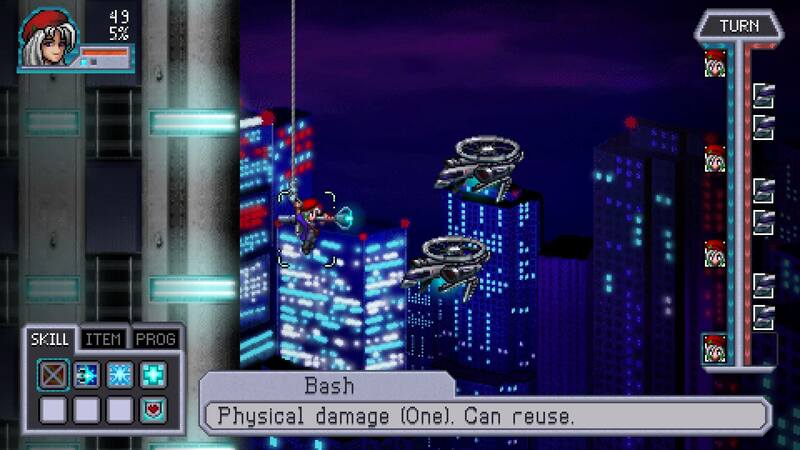 And, not to skip ahead too far, I was quite correct in my estimation that Cosmic Star Heroine would represent a new level of artistry for the studio. The task may have been large, but they were most certainly up to it. Alyssa is a really great addition to the cast of classic JRPG protagonists. I suspect that if this game was truly made back in the mid-90’s, you would still be seeing a lot of fan art of the protagonist Alyssa. 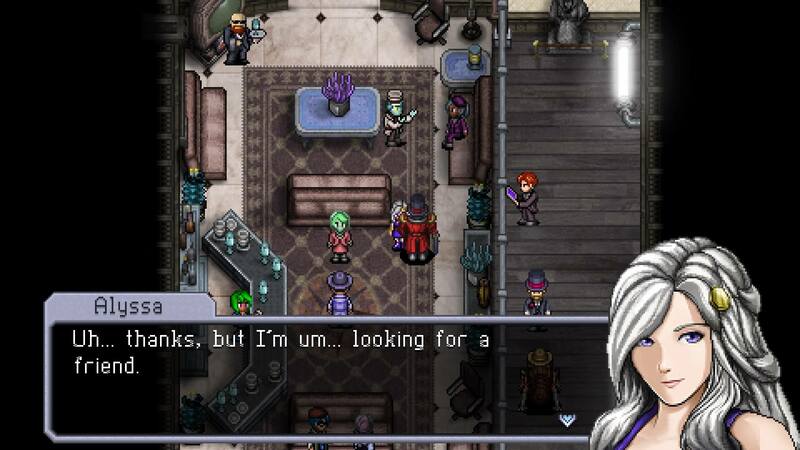 With the title Cosmic Star Heroine, that really does place a large burden on the heroine herself to be great. Thankfully there was really only one complaint I have about her, and that one issue is that we don’t get to spend even more time with her. They did ride a fairly fine line of making her not chatty but also not a silent protagonist. While the game’s strongest stylistic influence was definitely Chrono Trigger, it’s easy to forget that it featured a silent protagonist, as did many other heroes of that era. 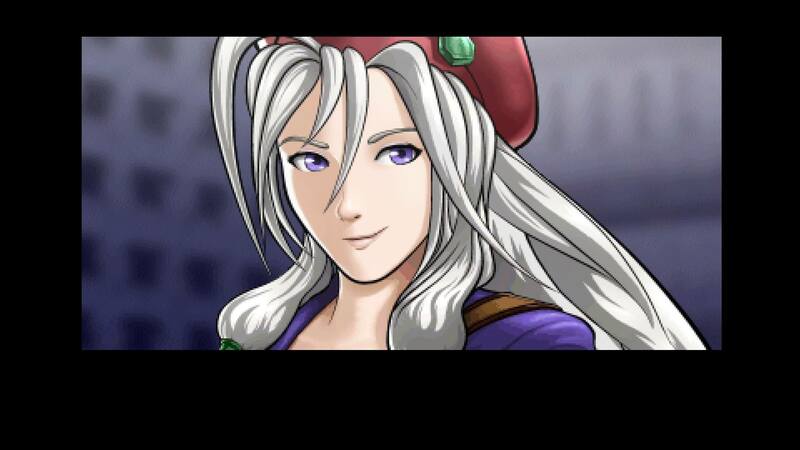 So instead think more Celes from Final Fantasy VI, only with less emotional baggage (for better, or for worse). 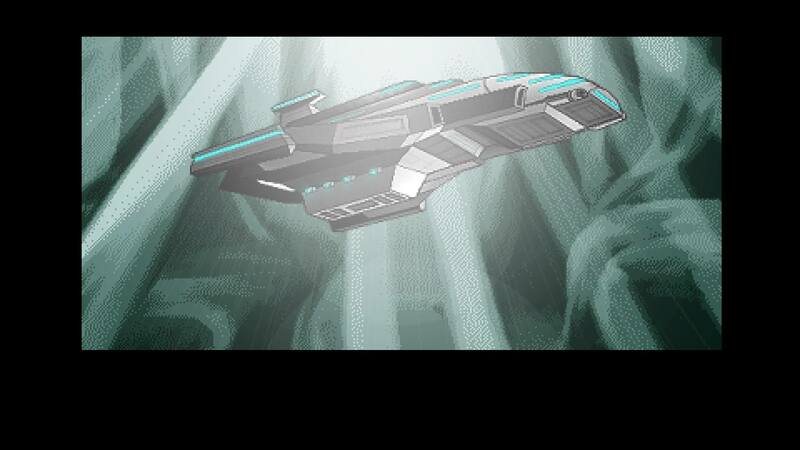 If you are going to set your game in space, make sure there are plenty of aliens. The combat system and world traversal are all very much Chrono Trigger, but the Phantasy Star influence comes from the space setting and also in the diversity of your companions. 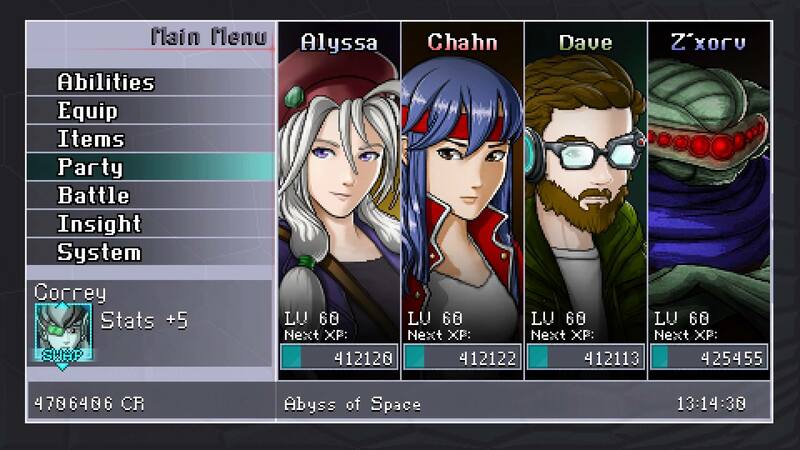 You do have several human companions of varying disposition, from the brawler Sue to the hacker Dave and your Gunmancer best friend Chahn, but the variety of the alien and robot party members keep the game very interesting well after all the humans have joined you. This is the case not just from an aesthetic standpoint, but also because no two characters share the same abilities. And the more alien a character is, the more strange and individual its abilities are. 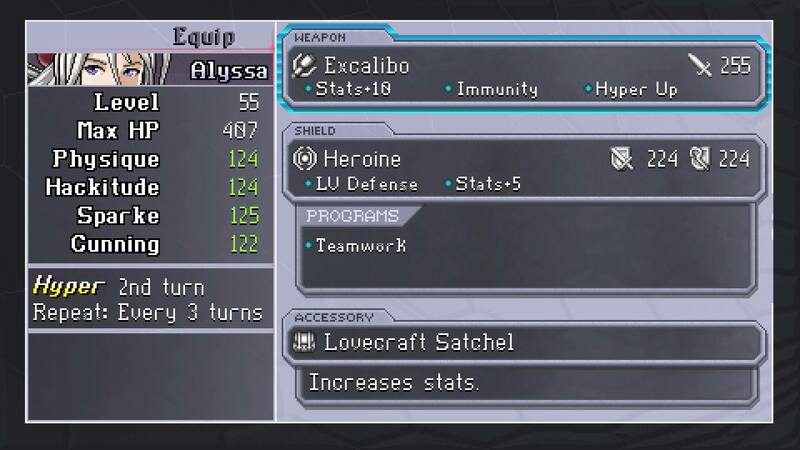 It is my way to basically always run around with a full party of female characters in any JRPG, that’s just always been the way that I play, but the bounty hunter alien you see above was so awesomely powerful that I had to sub one of my ladies out for the end game. That variety also made for some decidedly strange bedfellows, possibly the strangest was a self-professed ladies man robot who uses dancing to attack and buff. The story is a little on the short side, but it is quite well told in a very Sci-Fi B Movie way. The story may be on the short side, but it is well told. There is a certain B Movie quality about it that is quite tongue in cheek, but it’s self aware enough to play with those conventions a little and make specific references throughout the game. While the references to other Zeboyd products is the most common, there are also many movie, video game, and book references throughout the game as well. The less I say about the overall adventure, the better, since there is a very early spoiler that is what really sets you off on your Galaxy wide adventure. The overall story was able to keep me interested, but it mostly was just a good functional way to get this whole party of glorious misfits together. Without question the character personalities were much more of a focus than the classical hero’s journey. 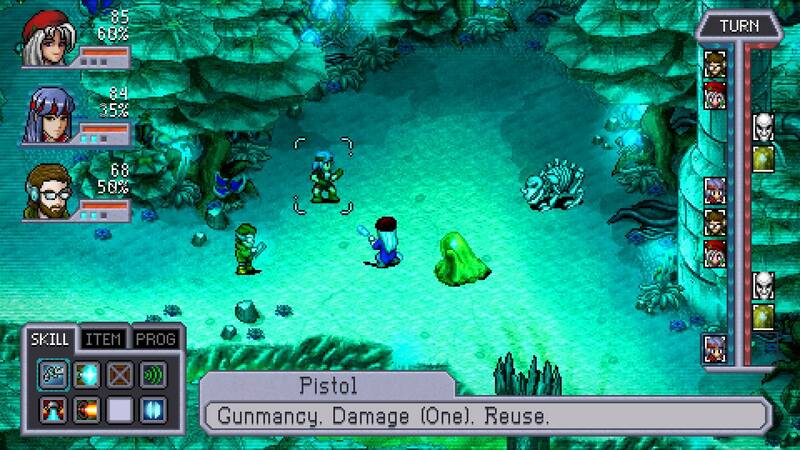 Entering combat is almost always the same as Chrono Trigger, but there are a few exceptions. You traverse the world maps in a style very similar to Chrono Trigger, where you have smaller sprite versions of your party wandering around the world and then you select a location to enter. There are no random battles on the overworlds or within the locations themselves, you will (almost) always see the enemy before you engage them, and then your party will distribute themselves around the battle map before you enter combat. There is one major change from the Chrono Trigger formula of getting into battle, though, and that is how you get into subsequent battles after you have already cleared out a map. The way you used to do that in the classic game was to go into another screen and then re-enter and all the non-boss enemy groups respawned. They did not do that for this game, but thankfully they did not go the route they went in the Penny Arcade games where you could not ever grind out the levels, that was a poor decision for the way that I play my JRPGs. Instead, for this title, they made a menu option called Battle, where you can select that and it will randomly respawn a VR simulation of a previous trash mob fight within that zone and you can just replay that fight for more XP and Credits. Engaging in a VR simulation fight does have some minor drawbacks in that the enemies are a little stronger and the rewards are a little less, but you do eventually gain an ally that can mitigate that penalty. So my only minor issue with that decision was that you have to go to the menu to select that Battle option instead of being able to map it to a controller button, but that is a very minor issue since the menus pull up very quickly in the game. Using VR battles to grind experience was a very fitting decision in a Sci-Fi setting. While largely the battle system is right out of Chrono Trigger (even including a special set of Teamwork skills that Alyssa gains access to mid-way through the game), there are a few changes to that system here. The first obvious change is that you can have up to 4 characters in battle instead of 3, but that’s a fairly small difference. You can also see the Turn order on the right side of the screen at any time, but the game doesn’t revolve around the turn order quite as much as the Penny Arcade games did, or really the Grandia games that set that whole trend into motion to begin with. Instead that Turn list was mostly just for some good information on timing some skills or defenses, there wasn’t a ton of need to keep the enemies from attacking by delaying their actions or anything. Really I enjoyed that decision, it made the combat more free wheeling and a little less strategic, but mostly in the fun direction. There is one major reason to keep the enemies from getting too many turns though, and that is that Style builds over time. In the screenshot above you see a percentage under each party member’s HP, and that is their Style which will continually grow with each ability they use (some build more than others). The growing style will allow them to do ramping damage with each ability over the course of the battle (up to a 300% maximum), but you can use up your style to make special Burst abilities even more damaging, at the cost of using all your Style. However, the enemies will also be steadily increasing their Style as well, so that is one reason you will not want them to take too many turns or stay around too long. You can only bring into combat 7 attack/buff abilities and 1 defensive/recharge ability at any time. You will also notice from the screenshots that the characters do not have any MP number and that green bar represents their health. Instead you have an interesting new combat style where you can only bring 7 attack or buff abilities into battle and you have 1 defensive/recharge ability. There are a couple abilities that can be used at any time (such as Pistol from above), but they tend to be very low powered unless the character is in Hyper Mode. All the other attack and buff abilities are single use for the most part, and they cannot be used again until you use a defensive/recharge ability to restore their uses. 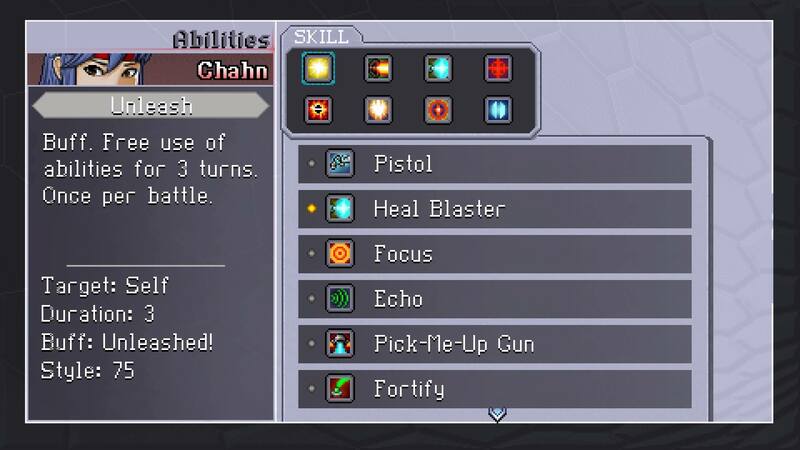 Some characters do have abilities that re-use abilities or give free use for a time, such as Chahn with Echo and Unleash, and some characters have a defensive ability which will also provide different effects such as healing or buffs or damage at the same time as it recharges your offensive abilities. So there is a lot of strategy in what characters you bring and what abilities you equip on them. Much as I enjoyed the previous Zeboyd games, this is definitely my favorite combat system that they have come up with so far. 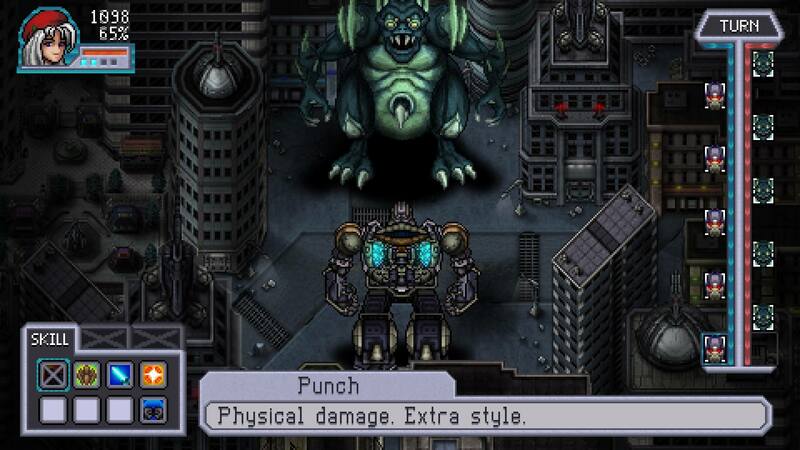 Some special fights really mix it up, like this giant mech versus kaiju fight very early on. With 3 different planets and a couple smaller installations, there is a ton of variety in the environment and in the enemies that inhabit each one. There are special fights that really change things up, like the giant battle you see above, but mostly it’s just nice to see so many different monster types in a game with a very small development team. 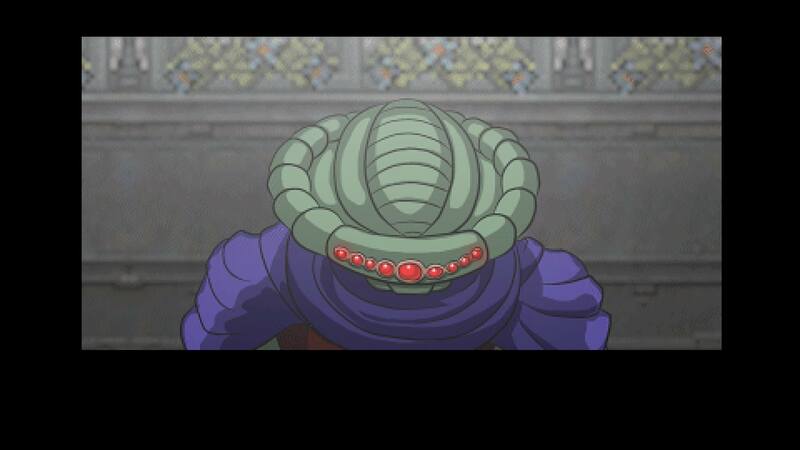 It was obviously a major focus of the team that they would not re-use any art assets to create re-skinned monsters, and that largely works in their favor. The only area where it does not work in their favor is that the game is on the short side. They succeeded on every other front with making a game that stands with its head held high among the other titans of the 16-bit JRPG era. If this game was released back then it would have received a ton of fans. But if it was released back then, it would be inevitable that they would have also received a lot of complaints about the short length of the game. This idea that shorter games are better is largely a modern construct and centers around a lot of the gaming public being adults with a lot of other things to do such as family and jobs. This game is not so short as to make it not worth the price, but a 12-20 hour game (depending on your grinding and the difficulty you choose) is about 1/3 the size of a peak Squaresoft game in that era. But mostly I just wanted it to be longer because what is here is such a great game, and I definitely wanted to spend a lot more time with these characters. There are some bonus missions to gain new abilities and gear for most of your party members, as well as major optional fights against a certain skeletal warrior and a devious eldritch god, but they are fairly short excursions. The optional quests are always worth doing, especially for some super sweet gear. It’s a fairly minor complaint that the game is a bit short when the game does not cost the full price of a AAA release. There was really only one quality complaint I have though and that was the lack of collision detection on any of the characters with other NPCs and the very nebulous detection with the environment. That made some NPCs very difficult to actually talk to, especially if they were moving, and it also made certain objects difficult to know where to click on them. It wasn’t enough of an issue to make me not enjoy the game, but that was the largest area where you could tell that the small team could have used some extra programmers to get that all buttoned down. However, enlisting the aid of HyperDuck Soundworks to do the soundtrack was a masterful move, and was worth the lack of extra programmers. If this game came out in the 1990’s, we would still be talking about this soundtrack in 2017. This is probably my selection for the best of the retro-cool soundtracks ever since the indie scene explosion has returned us back to some of the classic game designs. I would even say that, for me personally, this soundtrack is even better than the one for Shovel Knight. Peak Squaresoft is a lofty goal to reach for when it comes to gaming soundtracks (I still listen to the soundtracks to Chrono Trigger, Final Fantasy VI, and Xenogears), but they did an amazing job of reaching for that level. Adding new allies to your base will give you a large variety of buffs. Zeboyd Games has already started asking fans what their next game should be, and some of those selections are sequels to their previous games. But if there is one game that I would want to see from them more than any other, it would be a sequel to this game. I’m sure they want some time off, especially since they have needed several small patches to fix some minor issues on this one and there was the snafu involving PSN sending out the Beta version of the game on release day instead of the release version. But there is no question in my mind that this is their greatest release to date, and I want to spend at least twice as much time with all these different characters. Going back to the past for inspiration with today’s games does not work for every game developer and it’s not always what a modern gamer wants. But in this case, it was a match made in heaven. I was truly wanting something exactly like this, and these developers delivered a product that was even better than I was expecting. Is this game worth the $14.99 price tag? Really, that is a steal for such a quality release, I would not have been upset at all if it was double that price. Even if it is a bit shorter than the games it’s inspired by, everything else about it would have demanded that $60-$80 dollars we payed for SNES carts of that era. And even as a modern release there is so much good here that there is no doubt I will be revisiting this game many times over the years just to experience it all over again. The review copy of the game was self purchased as a Kickstarter backer for the game by the reviewer.